A purple glow seems to burst out of space in this stunning image of a cosmic gas cloud by skywatcher Bill Snyder. 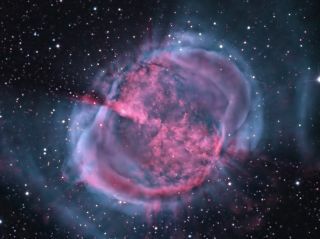 The photo depicts the Dumbbell Nebula, also known as M27, seen near the constellation of Vulpecula or "Little Fox." M27 is a planetary nebula. This is a type of emission nebula that forms when a star dies and emits a glowing shell of gas. In the distant future — more than 6 billion hers from now — our sun will likely puff off its outer layers to create a planetary nebula. In the photo, the nebula shines in two bright colors: The purple central glow is surrounded by a blue, hazy halo. These hues are due to hyrdogen and oxygen gas that has been ejected from the star out into space. This nebula is more than 1,200 light-years away (a light-year is the distance light travels in one year — about 6 trillion miles, or 10 trillion kilometers). For avid skywatchers, the nebula can be easily seen through an amateur telescope, and has an apparent magnitude of 7.5. On this scale, smaller numbers represent brighter objects. The dimmest objects visible to the human eye are about magnitude 6.5.